More than meets the eye: this humble-looking smart thermostat packs in many hidden features behind its budget-friendly price. Simple, friendly, and affordable – 2GIG’s CT100 smart thermostat doesn’t have a cutesy name or a flashy body, but it’s got most of the features you’d want in a smart thermostat for less than a hundred bucks! What’s the catch? The CT100 is a Z-Wave thermostat, not WiFi! 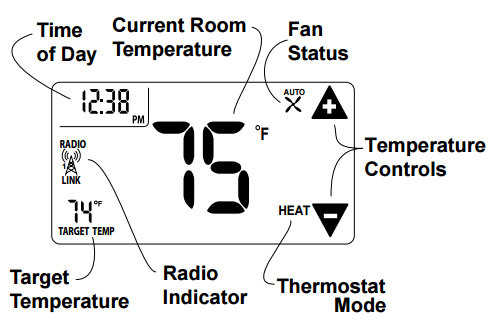 That means you’ll need a Z-Wave compatible home automation hub in your home to communicate with this thermostat. Z-Wave is really cool, but if you just want a budget-friendly smart thermostat (and not a home automation hub to go with it), check out the Sensi instead. There are a few simple on-unit controls, but in general, you’ll have to apply settings through the app associated with your hub. We think the 2GIG CT100 is great and award it 4.0 stars out of 5. To earn that last star we would want to see usage reports and the ability to program the thermostat from the unit itself. We think Z-Wave is cool, but buyers without a Z-Wave hub will have to get one in order to use this thermostat. However, at this price point, it’s really hard to fault the CT100. At the time of this writing, the CT100 boasts an an average rating of 4.3 out of 5 stars on Amazon.com. You won’t be able to use this thermostat remotely unless you have or are going to get a Z-Wave compatible home automation hub such as SmartThings, Mi Casa Verde Vera Lite, or Wink to go with it. These hubs are super cool and we whole heartedly recommend them if you have other smart devices in your home because a hub lets you centralize control of all those devices into one single convenient app. Thanks to its Z-Wave connectivity (as opposed to power-hungry WiFi), the CT100 can run on batteries alone for quite some time. How long, exactly, is a matter of debate, with some people reporting that it only runs for 2-3 months on batteries and others saying it runs up to a year. Some users report that using lithium batteries helps. You can’t set a program directly on the thermostat, and the unit itself doesn’t save its programming. It gets that information from the Z-Wave hub instead. With the CT100, you put your schedule in yourself. The CT100 doesn’t attempt to “learn” anything on its own. Tell me more about Z-Wave! Z-Wave is a wireless technology that allows household systems and devices to communicate with each other. It works on a different frequency than WiFi, so it won’t interfere with your existing network, just run in parallel. Z-Wave’s primary advantages are its low power consumption, larger communication range than WiFi (thanks in part to the “mesh network” capabilities where every device on the Z-Wave network acts as a relay, extending the range), and ease of use, especially when you consider that there are over 1000 Z-Wave compatible devices! Read more this cool home automation technology at Z-Wave’s own site. SmartThings and VeraLite’s Mi Casa Verde are two leading Z-Wave home automation hubs that the CT100 is compatible with, but there are loads to choose from including many that are part of home security systems. Most owners report that syncing up to their hub of choice was fast and painless. 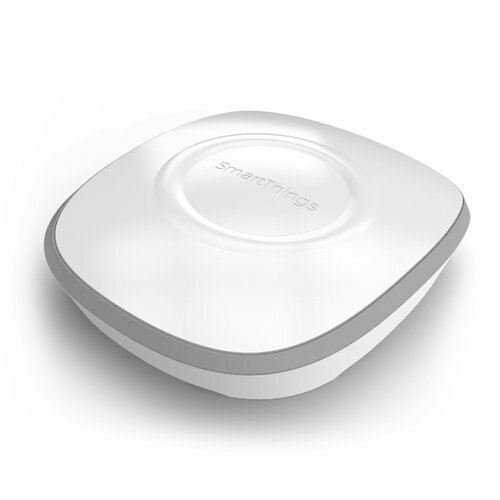 The SmartThings hub is one of the most popular home automation hubs that works with the CT100. 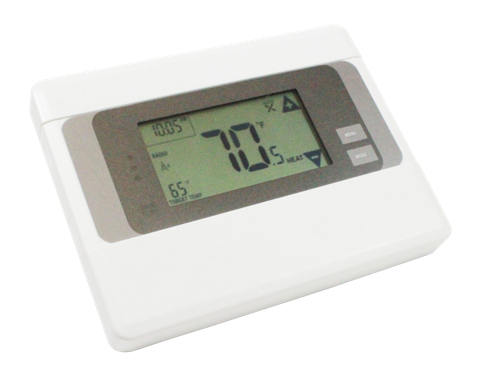 The CT100 is like a smart thermostat masquerading as an old school programmable thermostat. It’s almost flat against the wall (less than an inch thick) and the white plastic body won’t attract finger smudges. The touch screen might seem a little dated – it’s an old-school LCD and using it requires pressing (unlike your smartphone screen, for example), but most of your interaction with the CT100 would be through the hub’s app anyway. The on-unit display tells you the time of day, current room temperature, fan status, what mode is currently on (heat or cool), target temperature, and radio (Z-Wave) status. The temperature controls allow you to override the current target temperature. On-unit controls are limited to increasing or decreasing the current target temperature. The CT100 is a great choice if you already have a Z-Wave controller or want to get started with one. 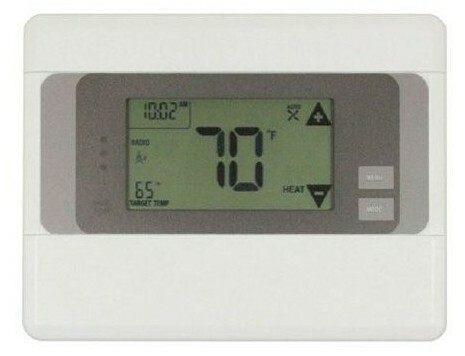 It’s like a programmable thermostat on steroids – you can’t do everything from the unit itself, but once it’s integrated with a Z-Wave system it’s a cinch to set up schedules and control it remotely. I purchased 4 of these thermostats for a new construction. After they were professional installed we realized the touch screen on one of them wasn’t working and there are no physical buttons. At this point it was too late to return from where I purchased it so I contacted the manufacturer asking about a warranty. They must be a small operation because no matter how many times I called the support line no one ever picked up. If you leave a message you may get a call back usually around 8 or 9 PM. At first they seemed helpful and told me that there was a 1 year warranty. They requested some documentation which I provided, then said the a replacement should arrive in 10 business days. It never did. When I called back (again leaving a message and getting a call back late at night) they apologized and informed me that the item was never sent and would check why. A few days later I got an email saying “your CT100 thermostat is not warranteed by Radiothermostat. We do not even have this model in stock”. Bottom line, if you still choose to buy this brand, hope that it works correctly out of the box as you will get no support at all.